The title screen is very inviting. The red-faced leprechaun, arms out, welcomes you to his grassy green homeland, full of rainbows and gold coins. Once you click the screen, he welcomes you to Rainbow Riches and a lively Irish jig plays. 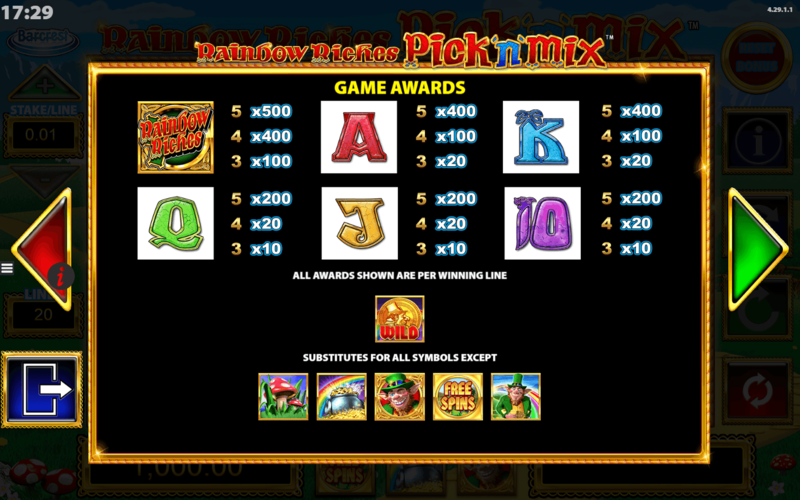 The next screen allows you to choose 3 bonus games out of a possible 5, proving from the outset that Rainbow Riches Pick ‘n’ Mix is destined to be a very generous online slots game. Take a look at some of the other online slots casino available today. Scientific Games (aka SG Interactive) is a global leader in iGaming, offering a fantastic suite of online slots games as well as various other lottery and casino games. if you love to play today, why not play these slot games? 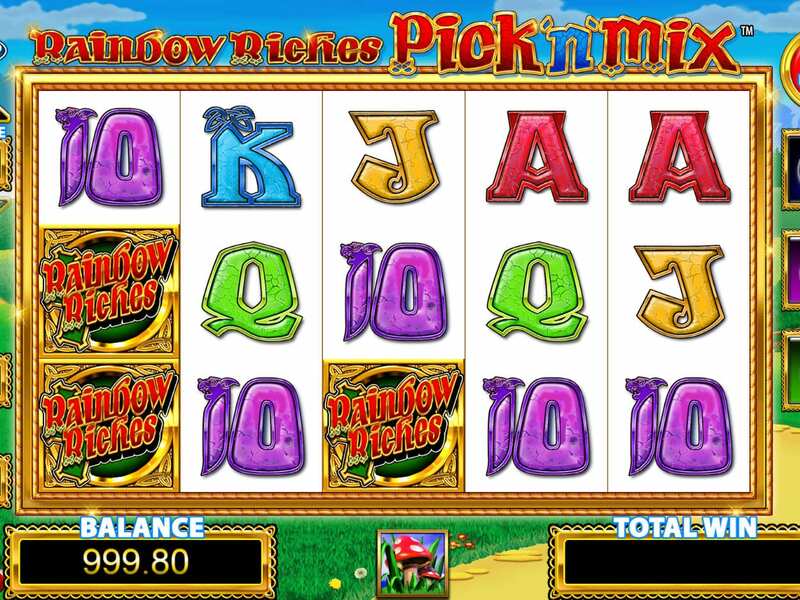 Rainbow Riches Pick ‘n’ Mix is an energetic casino game with a busy game screen offering plenty of options. Your balance is displayed clearly in the bottom left while the total win is visible on the bottom right of the screen. In between lay the icons for the 3 bonus rounds you have chosen. The right-hand side of the screen is full of option buttons: the ability to reset the bonus rounds, an info icon, a spin button and an automatic spin button. More of the UKs best slot games to play in terms of bonus features can be found from our guide. The most interesting button is the Big Bet Game button. Press this to be taken to a screen featuring a wheel for each chosen bonus game. The wheels will have a rainbow section and a green section of varying size. Spinning the wheel means you will either land on the green and be awarded 5 free spins or trigger the relevant bonus round when landing on a rainbow portion. Stakes are modifiable between 10 and 25, with higher stakes increasing the size of the rainbow portion. The music in this online slot game is pretty much restricted to the lively Irish jig that begins from the moment you first click the screen. Depending on your mood, this could be enjoyable or irritating! There are varying sound effects from the leprechaun speaking to the mad cackle when a WILD features on a winning line. There is also a pleasingly magical sound when you spin the wheels. While the visuals aren’t up there graphically with some of the top end slots online, everything is still charmingly illustrated here, even if the leprechaun himself still cuts a slightly creepy figure! The background is the same mixture of bright green grass, blue skies and yellow road paved with gold that features all over the core game. Elsewhere, the icons are well designed and various features of the bonus rounds (fairies, toadstools, etc) are all well realised. The Gameboard is the traditional 5x3 layout, so common with modern slots online. There are 20 winning paylines and a modifiable stake ranging from 0.01 to 25. With 20 lines in play, that constitutes a stake range between 20 and 500. There are 12 icons in total but only a maximum of 10 will appear in a single as the remaining two are bonus SCATTERS for bonus rounds you will not have chosen. Low value icons: The low values are 10, J and Q, awarding for x10 for 3 of a kind, x20 for 4 and x200 for 5. High value icons: Continuing the card-based icons, K and A award x20, x100 and x400 for 3, 4, and 5 of a kind. Top of the standard icons is the title tile, awarding x500 for 5 of a kind. WILDS and SCATTERS: Like the original Rainbow Riches, the WILD in this slot game is a gold coin with the leprechaun’s face. There are 5 bonus rounds and therefore 5 SCATTER icons, detailed below. Road To Riches: Represented by a SCATTER of the leprechaun popping out of a golden frame, 3 of these will trigger the Road To Riches bonus. Spin a wheel of fortune to determine how many steps along the road you take, increasing your multiplier the further you progress. Keep on spinning until you land on the COLLECT option or reach the end of the road and max out with a x500 multiplier! Hit 4 SCATTERS for increased multipliers. Pots Of Gold: Hit 3 pots of gold SCATTERS to trigger this bonus. Pots spin wildly around the screen in bronze, silver and gold. When they come to a stop, an arrow will land on one, revealing the multiplier within. Hit 4 SCATTERS when activating the round and only silver and god pots will be in play, guaranteeing a minimum of a mid-level reward. Free Spins: 3 free spin icons will grant you 10 free spins. 4 icons earns 20 free spins while 5 awards 30. Even better – free spins can be retriggered in the bonus game itself! Cash Crop: Get 3 icons of the leprechaun in front of a rainbow anywhere on the Gameboard and you will trigger the Cash Crop bonus. 50 coins spin on their axis with a multiplier on one side and nothing on the other. When they stop spinning, all multipliers are totted up in the win meter. Then one giant coin will spin to decide if you collect or continue. If you continue, the multiplier on the coins increase and will increase in a third and final round if you spin continue a second time. Magic Toadstool: 3 toadstool SCATTERS activate the Magic Toadstool bonus while 4 trigger the Super Magic Toadstool round. The player is awarded 3 picks from a field of 24 toadstools. Behind each toadstool is either a multiplier or a fairy. A fairy will uncover 3 more toadstools containing further multipliers or fairies, creating the potential for a chain reaction and big bonuses to be accumulated.